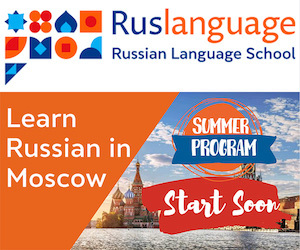 You don't need to get a Russian visa and buy a ticket to Moscow to learn Russian. Master RussianTM gives you the help you need to master Russian grammar, learn new vocabulary, practice in speaking and reading Russian, and learn facts about Russian culture and people. Here you will find free grammar lessons, useful vocabulary words and phrases, helpful tips on learning the Russian language, and hand-picked links to the best Web sites about the Russian language. Test your knowledge of facts about Russia, its history, politics, people, culture and cuisine. Upon completion, you will be rewarded a title based on your test results. Discover the frequency list of top thousand Russian words and their English translations. Learning most used words early in you your Russian study will have a significant impact on your mastery of the Russian language. Selected words are provided with example sentences, grammar explanations, and other useful information. The Russian word "давай" might look short but it has a lot of meanings, starting with "Let's", as in "Let's do it" to "Come on! ", "Ok, sure" and "Bye!" Listen to this Russian podcast to learn them all. This lesson will teach you essential words and phrases for speaking Russian in romantic situations. Learn how to express interest, give compliments, or express your deep feelings in Russian. How many letters is there in the Russian alphabet? What are their names? Here you will learn how to handwrite, type and pronounce the letters of the Russian alphabet. Learn how to say "hello" and other common greetings in Russian. Find a phrase that best suits the time of the day, the gender of the speaker, and the formality of the situation. The audio recordings will help you to speak Russian properly. Did you know that most Russian consonants can be pronounced two different ways (plain as in English or palatalized). In this lesson you will learn 20 consonant letters of the Russian alphabet and the sounds they represent. This onscreen Russian keyboard will enable you to type Russian online. Simply visit this page and use your mouse or keyboard to start typing texts in Russian. Join our friendly discussion of the Russian language and culture. The forum is the best place to ask for help with short Russian translations, express opinions and share experience with other language learners like you. Live and learn! You will surely find a proverb to your taste in this comprehensive list. In addition, all Russian proverbs are provided with English equivalents and literal translations. Learn about many aspects of the Russian cultural heritage, including history, traditions, arts, society, family and marriage, Russian holidays, cuisine. Discover latest trends, innovations, and developments in Russia. Idioms are phrases that are understood by native speakers but don't make any sense if you translate them literally. This mini-dictionary of Russian idioms covers such topics as Abundance, Attention, Emotions, Food, Problems, Prosperity, Success, Failure, Understanding and some others. It also includes a test on random phrases. Read what it is all about to learn a foreign language. This article describes reasons to learn Russian and gives practical advice on building your Russian vocabulary, improving your pronunciation, and learning Russian grammar. A must have reference table that groups Russian pronouns into classes, lists all pronouns for each class, and provides English equivalents. These vocabulary lessons are good to learn basic to intermediate Russian vocabulary. Topics include Farewells, Greetings, Acquaintance, Days of the Week, Countries, Holidays, Numerals, and more. Find your favorite female Russian name in our list of 90 most widely used first names for girls. This page includes lessons written by our guest authors. The topics cover Russian grammar, conversational situations, Russian culture, history and people. Please email us if you would like to contribute your own Russian lesson. Click the "Like" button below to become our fan on Facebook and get daily updates!